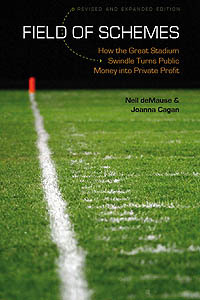 Fieldofschemes.com is the companion website to Field of Schemes: How the Great Stadium Swindle Turns Public Money Into Private Profit, by Joanna Cagan and Neil deMause. Since 1998, we have been casting a critical eye on the roughly $2 billion a year in public subsidies that go toward building new pro sports facilities. Neil deMause (de-MOSS) is a native New Yorker who has been a regular contributor to Vice Sports, Sports on Earth, Baseball Prospectus, Extra!, and City Limits, and who is currently news editor at the Village Voice. He went to his first baseball game at the age of four, though it wasn’t until age five that he learned to write “BB” for a walk instead of “W” on his scorecard. He is also the author of The Brooklyn Wars: The Stories Behind the Remaking of New York’s Most Celebrated Borough (Second System Press, 2016) and maintains his own website at demause.net. A long-suffering Cleveland sports fan, Joanna Cagan (KAY-gun) has umpired little-league baseball, been denied access to the Syracuse locker room for postgame interviews, and judged a pageant for male cover models. After witnessing one too many sports swindles, Joanna Cagan is now recuperating as a science educator in Colorado.